This painting is included in the online catalogue raisonné of Harold Harvey’s work by Peter Risdon. 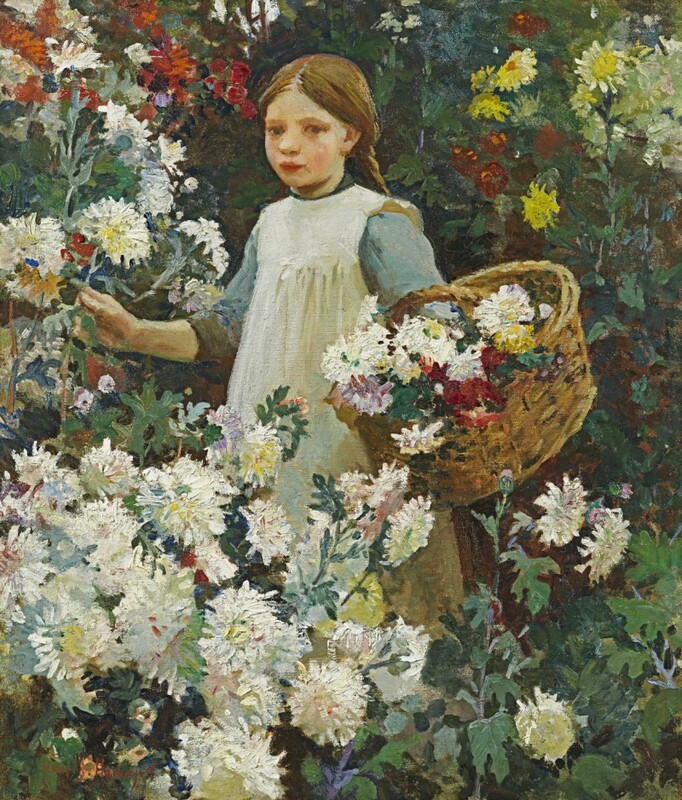 Picking chrysanthemums, painted in 1915, reflects Harvey’s move towards more enclosed, contemplative themes during the First World War. As were other Newlyn painters, including Laura Knight, Harvey was unable to paint landscapes because this was forbidden on grounds of national security. Instead, he sets his solemn young girl in a riot of late-summer blooms which emphasize her own beauty and the fragility of childhood, all the more poignant given the dire international situation. The oblique viewpoint and emphasis on surface decoration echo James Tissot’s painting of his companion Jo Heffernan in a greenhouse picking flowers, Chrysanthemums, c.1874-76 (Sterling and Francine Clark Institute, Williamstown, MA), but Tissot’s sensuality is here replaced by innocence. The allusive brio with which Harvey models the chrysanthemums shows his ultimate debt to Impressionism. He first studied under Norman Garstin, and then went to Paris during the 1890s where he continued his studies at the Academie Julian under Benjamin Constant and Jean-Paul Laurens. On his return, he married Gertrude, who was also an artist, and they settled in Newlyn. A prolific painter of varied subjects and styles, Harvey never achieved his due critical acclaim. He was a regular exhibitor at the Royal Academy from 1898-1941 and held several one-man exhibitions in London, at the Mendoza Galleries, Barbizon House and the Leicester Galleries. Harvey’s artistic development reveals an ability to assimilate the changing Newlyn styles. The muted palette of his first works denote an appreciation of the early generation, especially Alexander Stanhope Forbes. He then adopted more brilliant colours, comparable to the contemporary works produced by Laura Knight. From circa 1915, he painted in an increasingly flat, decorative style and broadened the range of his subjects to include sophisticated interior scenes. By the 1920s his figures, both in style and scale, betray the influence of Dod Procter. Essentially a realist painter of local life, Harvey’s works reflect above all a deeply felt commitment to his beloved Cornish home.